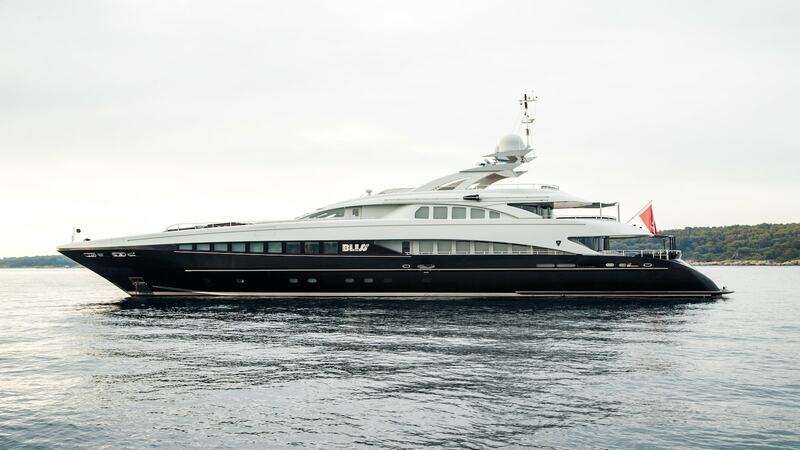 Bliss is a spectacular 44m Heesen motor yacht characterized by her striking black aluminium hull and matt grey superstructure. A semi displacement, high performance yacht she is powered by twin MTU 16V 4000 M90 engines enabling her to reach speeds up to 25 knots. The yacht features contemporary and cool interiors designed by prestigious Icelandic designer Ingibjörg St. Palmadottir. She is maintained in mint condition and to the highest standards and represents the perfect combination of Dutch quality and class. A Luxury Megayacht for Sale! Bliss can accommodate twelve guests in five well-appointed cabins, the configuration comprising of four doubles and a twin with a Pullman bed. Each cabin has its own unique design and style, ensuring guests can enjoy a welcoming and relaxing personal space to retreat to when on board. The upper salon can be converted to be used as an extra guest cabin with a Pullman king size bed. An elegant main salon forms the heart of the yacht; the large seating area and entertainment system is completed by a formal dining space, with circular table and leather seating, for enjoying sumptuous meals prepared by Bliss’ talented chef. She can accommodate 10 crew members on board to ensure the best luxury experience. Apart from generous interior spaces Bliss also has plenty of outdoor guest areas ideal for relaxation. Her large aft deck features exterior dining and seating, sunpads and a sunken seating area forward, and an upper deck with a Jacuzzi and sauna. She has an extensive list of toys to keep guests entertained at all times. The yacht is equipped with a modern and sophisticated stabilization system which decreases the rolling motion and enhances comfort on board while cruising. **Not offered for sale or charter to U.S. residents while in U.S. waters.